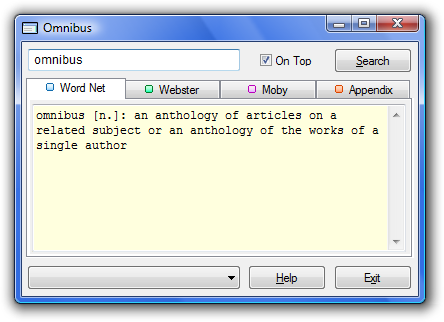 Zeno Systems Omnibus is a comprehensive English dictionary and thesaurus housed in a single, easy to use package. Featuring a corpus gleaned from several sources, this is truly a massive tome comprising very nearly 3 million cross-linked definitions, synonyms, and all manner of related terms. Writers, students, crossword, and scrabble players will find Omnibus to be an exceptional value. Highlights include, multiple lexicons, user defined appendix, compressed index, portability for use with removable media. no formal installation needed, zero 3rd party dependencies, will not touch your registry, free upgrades.